Japanese American Korean War Veterans (JAKWV) President Tohoru Isobe announced the appointment of Sam Shimoguchi as chairman for the 2016 JAKWV Nisei Week activities. JAKWV will host their annual Nisei Week Veterans Hospitality Room at the Japanese American Cultural and Community Center, 244 S. San Pedro St. in Little Tokyo, for all veterans and their families; widows and families of deceased veterans; veterans of peacetime services; and currently active servicemen and servicewomen. The Hospitality Room will be open on Saturday and Sunday, Aug. 13 and 14. It will be a place for relaxation and renewal of friendships and comradeship for veterans and their families and an opportunity to meet those currently serving in the military. There will be food and drinks (many of which have been donated), with tables and chairs located on the balcony with a view of the activities on the JACCC Plaza stage and in the shopping area below. The JAKWV will also participate in the 2016 Nisei Week Parade on Aug. 14 and wants as many Korean War era (June 25, 1950 to Jan. 31, 1955) veterans as possible to march. For those unable to march, vehicles will be provided. Come to the Hospitality Room to find out when and where to assemble for the parade. The uniform of the day is your service caps, if you have one. An information booth will be next to the National Japanese American War Memorial Court at the JACCC, where every Japanese American who died in combat for our country is memorialized. The booth will have newsletters, brochures, etc., for the general public, and for those who wish to honor any of the men who are memorialized there, stems of white carnations will be available. 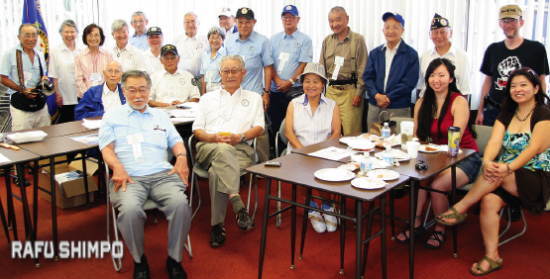 Serving on the 2016 JAKWV Nisei Week Committee are Mits Asakura, Deen Matsuzawa, Victor Muraoka, Tom Nakagawa, Mac Nakamura, Kats Nakatani, Joe Nimori, Mitch Sakado, Joe Sakamaki, Bacon Sakatani (photographer), Wally Takata, Min Tonai and Thomi Yamamoto. The Food Committee will be led by Toshiko Matsuzawa and Lois Muraoka, with assistance from many other volunteers. Saturday, Aug. 13 — Hospitality Room and Memorial Court Booth open 10 a.m., close at 4 p.m.
Sunday, Aug. 14 — Hospitality Room and Memorial Court Booth open at 10 a.m., close 3 p.m.